Comments can now be upvoted and flagged. How do those features work? Do users get rep for their upvoted comments? Do upvoted comments have any effect on comment sorting? And can users see their own comment upvote number somewhere? Some parts of this answer are taken from the 2009 Stack Overflow blog post Comments: Now with Flags and Votes. Note that flagging has changed considerably since that blog post. You need 15 reputation to upvote comments. Upvote a comment by clicking on the up arrow that appears when you hover the mouse over the comment. There is no downvoting of comments, only upvotes. You get 30 comment upvotes per day. Automatic comment upvotes when voting to close questions do not count toward the limit. Comment votes do not affect comment sort order. When there are many comments on a post, some comments are hidden when the page loads, and there is a button to “show N more comments”. The comments with the fewest upvotes are hidden first. The threshold depends on the number of comments on the post and whether the site is a main or meta site. When the question reaches a certain threshold of answers (30 on most sites), all comments with zero votes on both the question and all answers will be collapsed. No reputation of any kind is earned or lost from comment votes, though the Commentator badge is awarded for leaving 10 comments, and the Pundit badge is awarded to those who left 10 comments, each with a score of 5 or more. Comment upvotes can only be undone for a short time and while you did not navigate away from the page. Once you undo the upvote, you cannot upvote the same comment again. You cannot upvote a comment that you've flagged, until the flag is dismissed. You cannot upvote comments on locked posts. No rate limit on comment votes, meaning you can upvote as fast as you want. You have as many comment flags per day as you do post flags. Comment flags are counted separately from post flags. A comment flag counts the same as a post flag for calculating the amount of daily flags earned from net helpful flags. If a comment with zero votes and no trigger keywords (see below) is flagged by three users, it will be automatically deleted. There is no penalty for this. Flagged comments will be surfaced to moderators, so if you have a problem with a comment, flag it. Comments with upvotes require more flags to be deleted without moderator intervention: 1 more flag per 3 votes above 3 (i.e. number of flags = 3 + score/3). Comments containing certain "trigger" keywords are deleted instantly after a single flag, regardless of upvotes. The list of trigger keywords is kept secret, and may differ per site. You can always delete your own comments by clicking on the "Delete" button that appears when you hover the mouse over the comment. This is not a flag; it takes effect immediately. Comment flags cannot be undone. 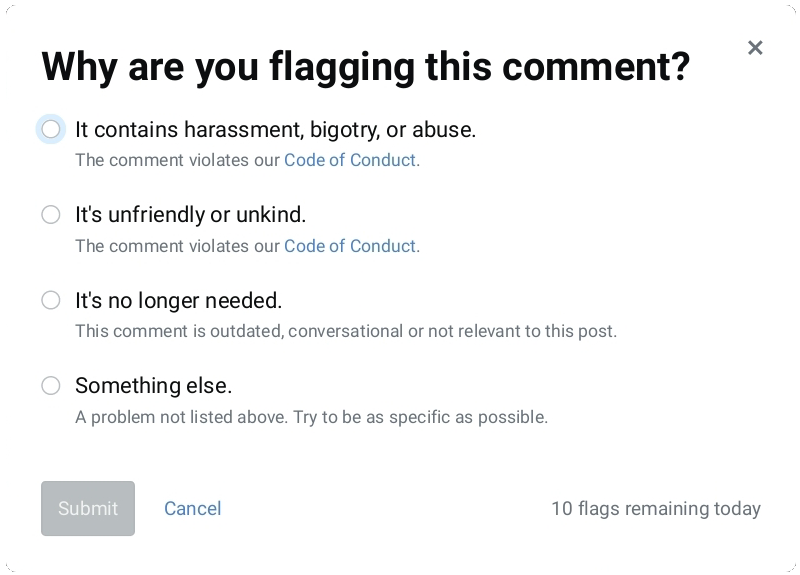 If not handled by a moderator or automatically deleted, "harassment, bigotry, or abuse" comment flags age away after 4 days. Comment flags do not affect the commenter in any way if a comment gets deleted, but they do count towards the flagger's helpful flags. The system does not notify you if your comment is flagged. Moderators can either mark flags as helpful and delete the comment, or leave it intact and decline the flag. They cannot manually dismiss comment flags, so borderline flags may be marked declined (though some mods may go through the extra step of marking it as helpful and then manually undeleting it). Also, they cannot provide a reason for dismissing a comment flag. You cannot flag your own comments. You cannot (re)flag a comments that you already have an active flag on. When should I flag a comment? It contains harassment, bigotry, or abuse. The comment attacks a person or group. The comment is rude or condescending. This comment is outdated, conversational or not relevant to the post. A problem not listed above. Try to be as specific as possible. See also When should comments be deleted?. Can users see their own comment upvote number somewhere? Unfortunately, there is no way programmed into StackExchange, that allows you to view your comment upvotes directly. However, you can still do it by using a MySQL query that I just wrote for this purpose. In the search box on the right, you should see user:#####. Copy this number (your UserID). At the very bottom of the page, there is a "Switch sites:" text box. In that box, type in the name of the site you wish to retrieve comments for. (The same site that you retrieved your UserID from.). Tip: Clicking the little gear between "Switch sites:" and the text box allows you to switch between the meta site and the regular site. In the "Userid" box (2 lines above), paste your UserID (which you got from your profile page), and click "Run Query" (next line). After about 3 seconds, the list of your comments with non-zero score should show up. That will allow you to view the post with your comment that got a high score. Not the answer you're looking for? Browse other questions tagged support faq comments comment-flags comment-voting . How do I upvote or downvote comments? What is the benefit of useful comment votes? What does the number near a comment mean? What happens after flagging a comment as noise, offensive or spam? Is “this comment adds something useful to the post” up arrow adds reputation to comment author? Why hasn't my daily reputation score updated after my comments were upvoted?